A delightful villain is a must-have for a good fairytale story, and Disney’s old, animated “Sleeping Beauty” had one of the greats – Maleficent. Now, Disney is turning the familiar tale on its head and retelling the story from the evil fairy’s point of view. Rather than the green-faced villain we know and love, we are presented with young fairyMaleficent, a strong and protective figure in the fairy kingdom. She’s kind and a bit naïve, especially when it comes to humans. When an older Maleficent (Angelina Jolie) falls for her human friend Stephan (Sharlto Copley), she puts her trust in someone undeserving. When Stephan betrays her for his own ends, she retreats into her homeland, conjuring a gigantic wall of thorns to separate the fairy and human kingdoms. Safe behind her walls, Maleficent stews and is warped by her rage and grief. It’s an interesting take on the story, giving us a villain we can both live through vicariously as she does villainous things and sympathize with. Betrayal can mess with the best of hearts. 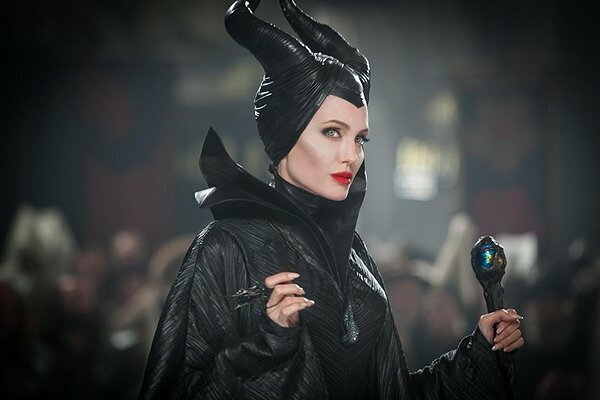 Jolie handles the changes her character undergoes with grace, keeping her indomitable will as a constant while Maleficent’s personality shifts from kind but fierce to wicked and cruel. The vast majority of the characters in the film are women, which is unusual in a big-budget movie and probably offputting to some folks, especially since the two significant male characters are Stephan (who’s evil through and through) and Diaval (Sam Riley),Maleficent’s servant. For folks who see a ton of movies, however, it’s rather refreshing to have a film that centers on women who make their own decisions and are powerful in their own rights. Once Stephan’s daughter Aurora (Elle Fanning) grows up a bit, she is somehow at once charming and completely annoying. She’s kind and optimistic to the point of ridiculousness, but Fanning somehow brings enough humor and thoughtfulness to the role that the young princess grows on us. The special effects are magnificent, which is vital in a magic-heavy story like this one. Jolie’s makeup takes some getting used to, especially her extended cheekbones, but the rest of the effects (both computer and physical) blend in just fine. Some parents may want to have their children wait to see “Maleficent” – there are huge woodland creatures that roar and crush people, and Stephan’s betrayal is pretty emotionally horrifying. Purists who love the old Disney film or one of the earlier versions of the tale enough to want the film to conform to that storyline should also stay away. But if you want to see an exciting, woman-centric, and surprisingly thoughtful film, check it out.